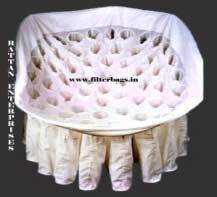 We manufacture, export, and supply various types of FBD, or Fluid Bed Dryer Filter Bags. These Fluid Bed Dryer Filter Bags are solution for drying, sizing, agglomerating or spray coating of delicate substances. Fluid Bed Dryer Filter Bags are made up of different types of superior quality fabrics, as per the requirement of the material involved in drying. Stitching is done on sophisticated imported machines that ensure long life, seam integration, and durability of the bag.